Teacher Appreciation Week occurs on the first full week of May in the United States and Canada. Also known as National Teacher Week, Teacher Appreciation Week is on May 6-10, 2013. Teacher Appreciation Day occurs on Tuesday of Teacher Appreciation Week, May 7, 2013. Outside the U.S., many other country celebrate Teacher Appreciation every October 5, World Teacher's Day. Typical Teacher Appreciation Week gift ideas include cards, pins, poems, letters, gift certificates, lunch, and gift baskets. If your theme or activities revolve around, remember to gift healthy (fruit, nuts, light snacks). We don't need our teachers falling into a sugar-induced coma during history class. That's the students' job. The best gift for teacher appreciation day is something homemade and from the heart. 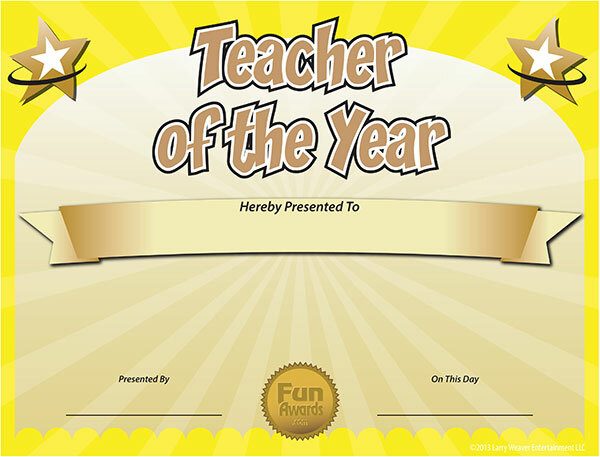 Quickly customize your own "Teacher of the Year" Award Certificate with our free printable PDF. You can type directly onto the certificate template and add your own message before printing. Within seconds you'll have a unique award that will bring smiles to your favorite teacher! Just click the link to download the PDF and enjoy!